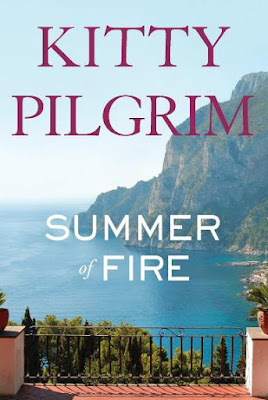 Beautiful Capri, Italy, and southern Italy's volcanoes are the settings for many of the events in Summer of Fire, an International Romantic Thriller. The reader gets to jet-set along with the characters through Italy, with stops in England, Norway, Iceland and France. Good guys, bad guys, lovers, adventurers all come together for an exciting finish. There was a magical timelessness to Capri A special atmosphere, and a sense of history. ... Nowhere on earth was more romantic. 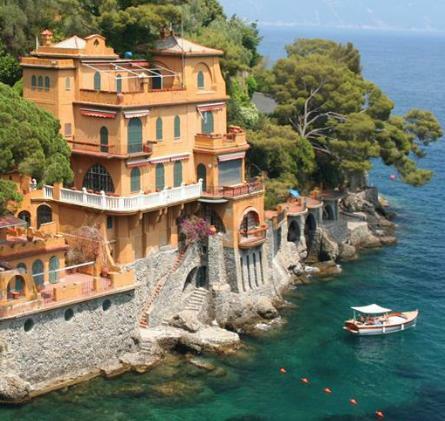 And Capri turns out to be a retreat for many of the book's characters, a place to escape the world, a romantic retreat. We get lots of threads as the book builds its plot: a forbidden love affair, a death that is possibly a gangster hit, a policeman determined to keep Capri mobster-free, a Camorra boss and his killer/burglar, teen boys seeking adventure, priceless jewels, and a loving couple who might make a deeper commitment if given a moment's peace. The author weaves all the stories together creating dangerous situations galore. There is some in-scene violence, and a handful of vulgarities. The writing is smooth (I always like more past-perfects than many writers use), and the story flows well. The voice is third-person limited, allowing us into the heads of various characters over the course of the book, but only one per section. This is a European crime story with lots of romance and some thrills and chills. I liked that the author had our heroes feel horrible when they had to take a life to save themselves or others, showing the difference between them and the sociopathic bad guys. I know there was no real choice. But it's still hard to kill a man. The author adds into the mix information on the active volcanoes in Europe, even putting us over one as it erupts, and on another as the lava starts to flow. This International Romantic Thriller is a fun read for a holiday, or when you just want to feel like you're on holiday, perhaps just to enjoy the fantasy of being in the Capri villa along with the book's characters. Magari! 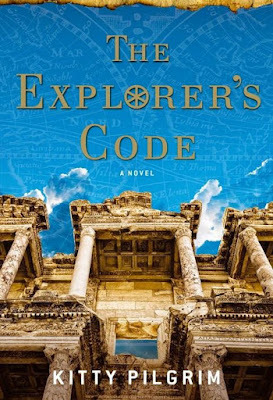 Award-winning CNN journalist Kitty Pilgrim turns her talents to print in The Explorer’s Code, an exciting international thriller that revolves around the quest for a land deed valuable enough to kill for. When the renowned young oceanographer Cordelia Stapleton receives an invitation to accept an award on behalf of her great-great-grandfather, a famous Victorian polar explorer, she has no idea her life is about to change dramatically. John Sinclair—a dashing, wealthy archaeologist and philanthropist—presents Cordelia with the award at the glamorous Oceanographic Institute Ball in Monaco. He also gives her a journal that her great-great-grandfather wrote in 1908. An orphan with very few family belongings, Cordelia is amazingly touched to have this precious heirloom. Once the journal is in her possession, Cordelia learns that she is heir to the land on which the Global Seed Vault in Norway sits. The valuable deed for this land, or at least a clue to its whereabouts, may be hidden in the journal. The Explorer’s Code is a satisfying blend of historical detail, fast-paced action, scientific discovery, and the thrill of exploration that informs as well as entertains. The breathtaking ending in the high Arctic is as chilling as a polar breeze. 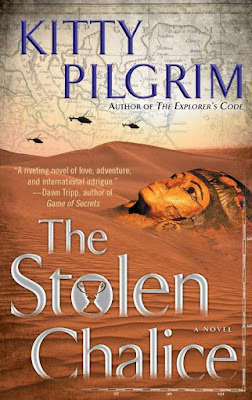 CNN veteran Kitty Pilgrim returns with her second novel featuring the beautiful young oceanographer Cordelia Stapleton and the dashing, urbane archaeologist John Sinclair. Set in the international art world, The Stolen Chalice takes readers across the globe. 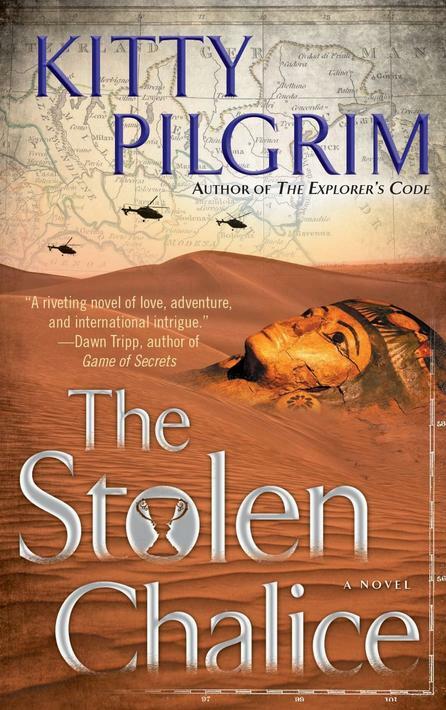 Bombings, kidnappings, and Sinclair’s old love conspire against the couple as they search for valuable Egyptian art. The black-tie gala at the Metropolitan Museum of Art promises to be a star-studded evening. Cordelia Stapleton and John Sinclair have flown in from Alexandria, Egypt, to help celebrate ancient Greek, Roman, and Egyptian culture with New York’s elite. The influential crowd of artists, collectors, scientists, and New York society dine and dance at the museum’s historic Temple of Dendur, unaware that terrorists are planning to attack. Fortunately, museum security and police stop the terrorists, but the evening is a disaster. The next morning, Cordelia and Sinclair learn that an art theft ring struck New York while they were at the museum. All over the city, pieces of Egyptian art have been stolen. Ted VerPlanck—a pillar of New York society whom Cordelia met the night before—discovers that his penthouse apartment was robbed and the legendary Sardonyx Cup, an ancient Egyptian chalice, is missing. Ted asks John Sinclair to help him recover his precious artifact. When nature takes charge, sparks fly. On the beautiful island of Capri, a royal princess begins a secret love affair, oblivious to the dangers that surround her. Internationally renowned novelist Kitty Pilgrim chronicles a modern thriller based in the historic volcanic region of Southern Italy. Her characters, archaeologist John Sinclair and oceanographer Cordelia Stapleton, team up once again for a tale of glamour and romance that spans every level of society—from the dangerous criminal underworld of Naples to the jet set of Europe. Please visit the author's website where she has many videos showing the research she does for her books.